Today is the launch of THE DEEP DARK DESCENDING, my fourth novel. I'm excited to see it head out into the big world, and am grateful for the buzz it's getting. Entertainment Weekly has it on the top of their list for Best New Books (Oct. 6 ed. 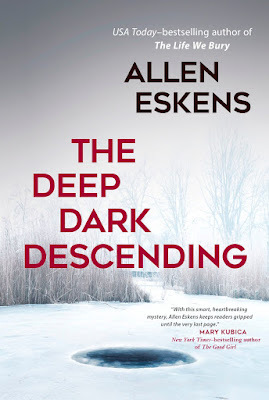 ), and Amazon has chosen it as one of their Best Books of the Month, next to such names as Stephen King, Dan Brown, Harlan Coben, John Grisham, and more. I am also grateful to all the blog reviewers who take the time to read my work and comment on it. Your support is instrumental and greatly appreciated. I am particularly grateful to Wendy Tyson who wrote a wonderful feature article about me and my books for The Big Thrill magazine. Today I begin the publicity tour and couldn't be more pleased. I look forward to meeting readers, so if you have a chance, stop by one of my events if you can. Now, back to writing! Page 1, even if it’s a page of description, must raise questions, suspicions and expectations; the mind casts forward to later pages, wondering what will come about and how. It is this casting forward that draws us from paragraph to paragraph and chapter to chapter. The moment we stop caring where the story will go next, the writer has failed and we stop reading.